In the hyper-competitive environment, it is difficult for business houses to survive, grow and expand in the long-run if they do not have strategic planning. A strategic planning is an activity, which determines the objectives and considers both internal and external environment to design, implement, analyze and adjust the strategies, to gain competitive advantage. Strategic Planning is not exactly same as strategic management, which implies a stream of decisions and actions taken by the top level managers to achieve organizational goals. It is nothing but the identification and application of strategies, to improve their performance level and attain dominance in the industry. 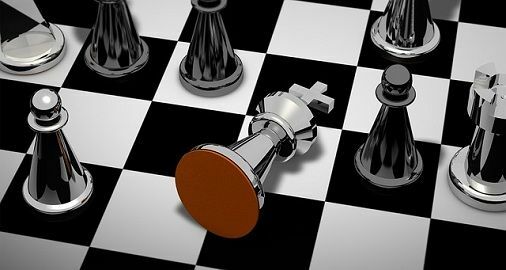 Many think that the two terms denote one and the same thing, but there is a difference between strategic planning and strategic management which explains the article hereunder, take a read. Meaning Strategic Planning is a future oriented activity which tends to determine the organizational strategy and used to set priorities. Strategic Management implies a bundle of decisions or moves taken in relation to the formulation and execution of strategies to achieve organizational goals. Stresses on It stresses on making optimal strategic decisions. It stresses on producing strategic results, new markets, new products, new technologies etc. Management Strategic planning is a management by plans. Strategic management is a management by results. Function Identifying actions to be taken. Identifying actions to be taken, the individuals who will perform the actions, the right time to perform the action, the way to perform the action. Strategic planning may be understood as the long-term forward-looking activity, performed by the high-level managers, that focuses on the organization as a whole. It establishes the overall objectives of the enterprise, frame policies and most importantly, assist in the determination of the organizational strategy, to meet competition and survive and grow in the market. In simple terms, strategic planning can be defined as an official consideration of the future course of action of the enterprise. Strategic Management is a top management function which is employed to set priorities, concentrate and channelize resources, reinforce operations, ensuring that the employees are aligned towards the achievement of the goals of the organization and position the organization with respect to the changing environment. It ascertains organization’s intent for the next five years. Top Down Approach: It delineates a centralized approach to strategy formulation, in which the center determines organization’s vision, mission, objectives, and goals. Bottom-up Approach: Autonomous or semi-autonomous units are featured with bottom-up approach, wherein the corporate centers do not determine the strategic role. By the term strategic management we mean, the process that helps the organization to assess their internal and external business environment forms strategic vision sets objectives, establish direction, formulate and implement strategies that are aligned towards the achievement of the goals of the organization. Strategic management aims at gaining sustained competitive advantage, so as to supersede competitors and attain a dominating position in the entire market. Further, it assesses, guide and adjusts the enterprise, according to the changes in the business environment. 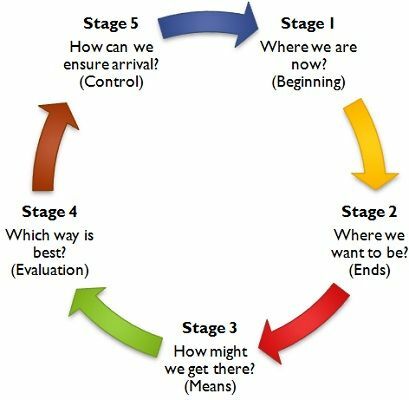 The figure provided below explains the strategic process, in the sequence of various stages. It is a dynamic process of designing, implementing, analyzing and controlling strategies, to ascertain the strategic intent of the company. It begins with the development of mission, goals and objectives, business portfolio and plans. A future-oriented activity which tends to ascertain the organizational strategy and used to set priorities, is called strategic planning. On the contrary, strategic management is a series of decisions or moves taken by the top managers in relation to the formulation and execution of strategies to achieve organizational goals. While strategic planning focuses on making optimal strategic decisions, strategic management is all about producing strategic results, new markets, new products, new technologies etc. Strategic planning activity uses management by plans, whereas strategic management process uses management by results. The strategic planning is an analytical activity because it is related to the thinking. On the contrary, strategic management is an action-oriented activity. Strategic planning involves the identification of actions to be taken. 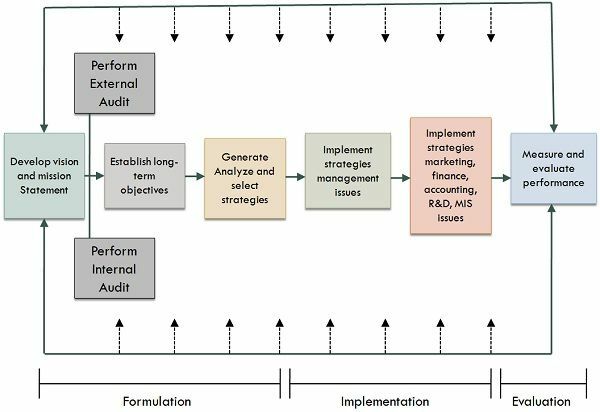 Conversely, Strategic management involves identification actions to be taken, the individuals who will perform the actions, the right time to perform the action, the way to perform those action. The scope of strategic management is greater than the strategic planning, in the sense that the latter is one of the important components of the former, that encompasses drafting strategies, to stand in the competition and is helpful for the survival, growth, and expansion of the company. Strategic planning is an activity performed by the top management of the organization, that helps to relate the organization with the business environment. An awesome analysis with conclusion, very helpful for the professionals especially who are not sure which qualification they should go for in strategic education, management or planning…..very well done. any references for those distinctions? I concur with the conclusion in that strategic planning is one of the components of strategic management, an important and an essential one at that.